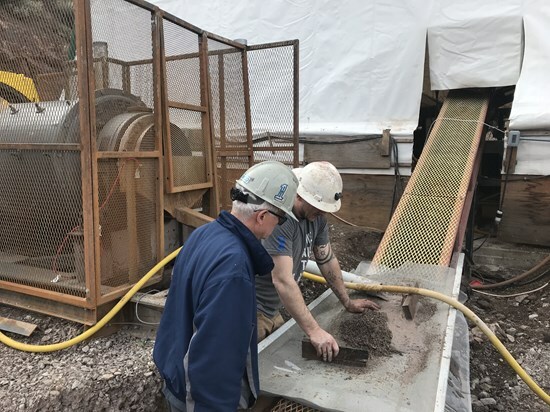 Vancouver, British Columbia--(Newsfile Corp. - April 15, 2019) - Bayhorse Silver Inc., (TSXV: BHS) ("Bayhorse" or the "Company"), has received final results from the comprehensive metallurgical testing, setup, and processing/refining program conducted by Mineral Solutions LLC ("Minerals") of Coeur d Alene, Idaho, USA, on silver concentrates from its Bayhorse Silver Mine, Oregon, USA. This final exhaustive metallurgical testing was conducted to ensure that both Bayhorse concentration equipment, and the Minerals processing facility, are attuned for optimum processing/refining recovery of silver from the Bayhorse mineralization. Dr. Mike Irish of Minerals oversaw the final set up at the Bayhorse Silver Mine to ensure the Bayhorse silver concentrate met their parameters for leaching/refining using their wet chemical process for sulphide minerals processing. Minerals had already tested the Bayhorse highgrade mineralization, at 300 - 350 oz/ton Ag, (9,310 - 10,866 g/t) and compared the results to lower grade mined mineralization. Fresh mineralization in a lower grade section of the mine, in the range of 6 oz/ton to 20 oz/ton, (186.6 - 622 g/t) Ag was extracted from a new crosscut for this comparison. The silver mineralization, with a calculated head grade of 8.12 oz/t (252.5 g/t) Ag, was first processed through the ore-sorter. As determined using mass balance calculations, ore-sorter upgrading to 31.22 oz/t (971 g/t) Ag was achieved, with rejects grading 0.6 oz/t (18.66 g/t) Ag.The subsequent gravity concentrate, assaying 209.8 oz/t Ag (6,525.5 g/t), was processed and refined by Minerals with 95% recovery, with the tails grading 3.22 oz/t (100.15g/t) Ag. With the final testing and equipment array set ups complete at both Minerals and the Bayhorse Silver Mine, the Company is proceeding with concentrating and shipping fresh sulphide concentrate to Minerals for processing and refining into .9999 fine silver. Bayhorse CEO Graeme O'Neill comments: "We are very pleased with the excellent final metallurgical results and silver recoveries by Minerals. Our decision to collaborate with Minerals, utilizing newly developed in America technological processes, in advancing our Bayhorse Silver Mine, instead of directly shipping concentrates overseas for smelting and refining, was the right decision and well worth the extra time it has taken to get things right." The Company is planning, in collaboration with Minerals, a second, modular containerized processing and refining facility in Canada for testing sulphide concentrates at the new Brandywine project, and for processing and refining other available, identified, sulphide concentrates. The Company is not basing any decision to produce on a feasibility study of mineral reserves demonstrating economic and technical viability, and also advises there is an increased uncertainty and specific economic and technical risk of failure with any production decision. These risks include, but are not limited to, a drop in price of commodities produced, namely silver, copper, lead and zinc, from the pricing used to make a production decision. Failure of grades of the produced material to fall within the parameters used to make the production decision and increase in mining costs due to changes within the mine during development and mining procedures. There are also metallurgical recovery changes that cannot be anticipated at the time of production.